In this tutorial we will show you how to install and configuration Jenkins on Ubuntu 16.04 LTS server. For those of you who didn’t know, Jenkins is an open source continuous integration tool written in Java. Jenkins provides continuous integration services for software development. It is a server-based system running in a servlet container such as Apache Tomcat. It supports SCM tools including AccuRev, CVS, Subversion, Git, Mercurial, Perforce, Clearcase and RTC, and can execute Apache Ant and Apache Maven based projects as well as arbitrary shell scripts and Windows batch commands. This article assumes you have at least basic knowledge of linux, know how to use the shell, and most importantly, you host your site on your own VPS. The installation is quite simple and assumes you are running in the root account, if not you may need to add ‘sudo’ to the commands to get root privileges. I will show you through the step by step installation Jenkins on a Ubuntu 16.04 (Xenial Xerus) server. Jenkins will write log files to /var/log/jenkins/jenkins.log. You can also fine-tune the configuration. Step 4. Installing and Configure Apache web server for Jenkins. 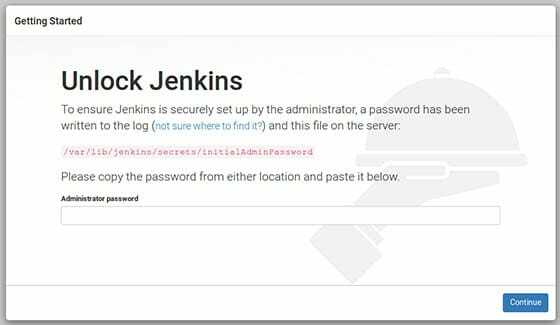 Jenkins will be available on HTTP port 8080 by default. Open your favorite browser and navigate to http://yourdomain.com:8080 or http://server-ip:8080 and complete the required the steps to finish the installation. If you are using a firewall, please open port 8080 to enable access to the control panel. Default installation password can be found at /var/lib/jenkins/secrets/initialAdminPassword as showing in below image. Congratulation’s! You have successfully installed Jenkins. Thanks for using this tutorial for installing Jenkins on Ubuntu 16.04 Xenial Xerus server. For additional help or useful information, we recommend you to check the official Jenkins web site. Related Posts of "How To Install Jenkins on Ubuntu 16.04 LTS"